Unfortunately time constraints (i.e my day job) keep getting in the way of me updating this site so all Ive been able to do so far for the Southampton Nickname page is a very basic bit of background. 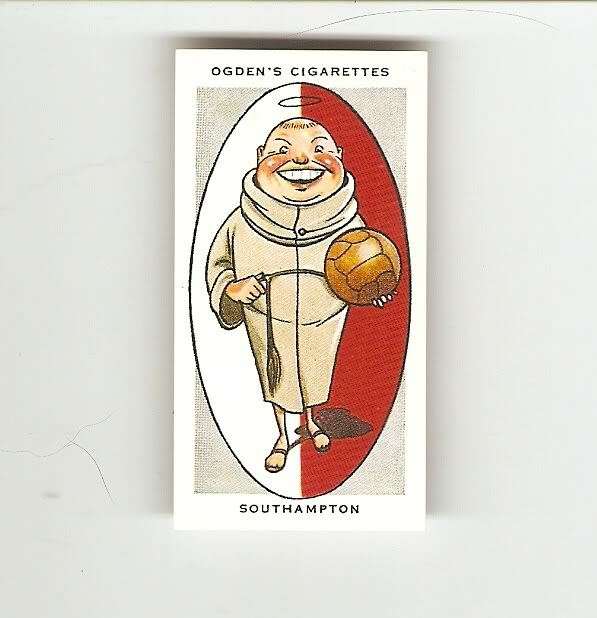 Ive shown below a football cigarette card from the Ogdens AFC Nicknames series that shows a caricature that probably makes any Southampton fan cringe with embarrassment as its not exactly the most flattering of images .... an obviously jolly gay Priest !! "Started by members of St Marys Church, Southampton from their earliest days have been known as the "Saints", although it was not until 1897 that a company was formed and the name changed from St Marys. They joined the Sourthern League and soon became one of the leading clubs in the south. They are now in the Second Division. Their greatest triumphs were in the Cup competetions of 1900 and 1902. In each of these years they reached the Final, but in the first match they lost to Bury, and in the second to Sheffield United. During this very successful period C B Fry, the famous amateur, was a conspicuous member of the team as a back". So,there you have a very brief history to the Saints Nickname, dont worry though I will be coming back to this page to expand on this particular football nickname a bit more !